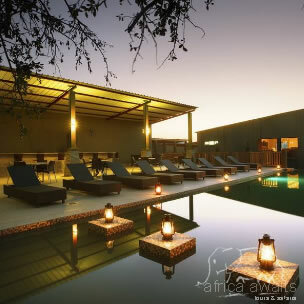 Shepherd’s Tree Game Lodge is a lodge concession within the existing Pilanesberg Game Reserve. The entire lodge lies in an exclusive use zone in the south-western portion of the 57,250ha, "Big 5" and malaria free Reserve. Guests will enjoy both private traversing and access to all the Reserve’s public roads. The lodge offers commanding views of the distant bushveld amphitheatre and is superbly positioned adjacent to the Wilderness Area, thus offering the opportunity of walking trails in this untouched environment. The design feature accommodates 13 family suites (136m²) and 4 spacious executive suites (86m²) situated adjacent a magnificent main lodge. The placement and design of each suite ensures privacy and uninterrupted views. Each suite offers the highest quality equipment with plasma screen TV, Satellite Television and a mini-business centre. 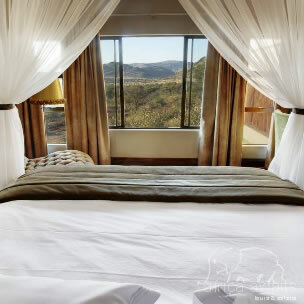 * A host of nature and safari activities are on offer in the full Pilanesberg Game Reserve, as well as in our private exclusive use area. 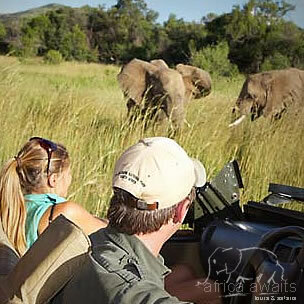 * Game Drives - The lodge will offer dedicated game rangers with open game viewing vehicles. * Game Walks - Experienced trails rangers will lead you on unforgettable walking trails through the wilderness. * Health & Beauty Spa - You will be ensured of the most indulgent and pampered of experiences. * Quad Biking - Experience the thrill and adventure of riding along through the bush on these exciting and powerful machines. * Air Gun Shooting - Test your abilities at target shooting with an air rifle and pellets. * Archery - Test your hand at this ancient art using our modern re-curve bows. * Tribal Shows - Savour an overwhelming, dynamic and powerful Tswana and Zulu dance experience that will get your heart pounding. * Interactive Drumming - Participate in creating a rhythmic African drumming vibe. * Percussion Band - Experience tremendous drumming on a variety of drums and instrument that include djembe drums, conga drums, cowbells and shakers. * Specialized Talks - Our knowledgeable game rangers have each prepared talks and are keen to share their knowledge with you on a variety of topics. With your holiday, safari or business trip from in to Shepherd�s Tree Game Lodge in Pilanesberg.